Dutch landscape firm West 8 has masterplanned a new botanical garden in Houston, Texas, featuring a mosaic of gardens and a bridge incorporating an arch of trees. Encompassing 120 acres (49 hectares), the Houston Botanic Garden will replace a golf course in the suburb of Glenbrook Valley, near the city's airport. The area is bordered by the Sims Bayou, a major waterway in Houston. Plans for the garden first emerged decades ago and finally gained momentum last year, when the city agreed to grant a long-term lease for the proposed site to a group spearheading the project. Some residents in the area have opposed the plan, citing the potential for increased traffic, the loss of the golf course, and disruptions from construction activity, according to reports. President and CEO of the Houston Botanic Garden, Jeff Ross, told the Houston Chronicle that "no change happens without angst”. "We're very committed to working with the community and problem-solving," he said. West 8 said its scheme capitalises on the site's existing qualities while also considering environmental threats. "The plan takes its inspiration and structure from the best qualities of the existing site, and gives forethought to the biggest environmental challenges: flooding and intense weather events,” said the firm. The firm's scheme calls for organising the park into two main zones: the South Gardens and the Island. Visitors arrive at the South Gardens area, which features an open lawn for picnics, strolling and special events. A hiking and biking trail will extend along an existing road and will also link up with a city trail system, and a covered bridge topped with trees will traverse the bayou. "The design proposes lifting the existing topography to elevate the gardens and permanent structures out of the flood plain," said the firm. The Island will feature a variety of outdoor gardens, along with a conservatory building with exotic plants from tropical climates. "These gardens provide year-round beauty, delight the senses, and educate young and old alike," said the firm. The plan calls for an extensive network of pathways, many of which will have colonnades that provide shelter from the sun and rain. Amenities including an events pavilion, a cafe and a lecture hall will be strategically located throughout the site. 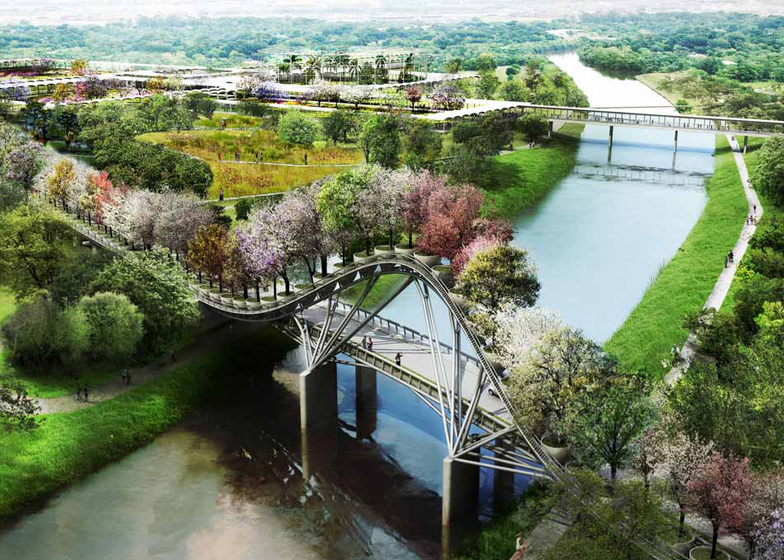 "West 8's masterplan for the Houston Botanic Garden amplifies the potential of the site's qualities and unites the site into a coherent 'only-in-Houston' garden experience," said the firm. West 8 has offices in Rotterdam, New York and Belgium. Other projects by the firm include The Hills on Governors Island in New York and the Garden of 10,000 Bridges in Xi'an, China.